Something has gone seriously wrong with the American economy. The American economy has experienced considerable growth in the last 30 years. But virtually none of this growth has trickled down to the average American. Incomes have been flat since 1985. Inequality has grown, and social mobility has dropped dramatically. Equally troubling, these policies have been devastating to both American productivity and our long-term competitiveness. Many reasons for these failures have been proposed. Globalization. Union greed. Outsourcing. But none of these explanations can address the harsh truth that many countries around the world are dramatically outperforming the U.S. in delivering broad middle-class prosperity. And this is despite the fact that these countries are more exposed than America to outsourcing and globalization and have much higher levels of union membership. In What Went Wrong, George R. Tyler, a veteran of the World Bank and the Treasury Department, takes the reader through an objective and data-rich examination of the American experience over the last 30 years. He provides a fascinating comparison between the America and the experience of the "family capitalism" countries: Australia, Austria, Belgium, Denmark, France, Germany, the Netherlands, and Sweden. Over the last 30 years, they have outperformed the U.S. economy by the only metric that really matters--delivering better lives for their citizens. The policies adopted by the family capitalist countries aren't socialist or foreign. They are the same policies that made the U.S. economy of the 1950s and 1960s the strongest in the world. 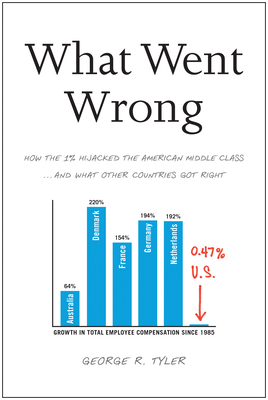 What Went Wrong describes exactly what went wrong with the American economy, how countries around the world have avoided these problems, and what we need to do to get back on the right track. George R. Tyler has a diverse background, drawing on his broad experiences at the highest levels of government, at the World Bank, in the private sector, and in the international nonprofit sector for What Went Wrong. Trained as an economist, Tyler served on the staffs of senators Hubert H. Humphrey and Lloyd Bentsen early in his career and was appointed by President Bill Clinton in 1993 as a deputy assistant treasury secretary. He subsequently served as counselor at the World Bank which marked the beginning of his international career. Tyler has expansive private sector experience as founder and CEO of a real estate investment and development firm, creating a number of resort residential and residential subdivisions in Virginia, a role he continues to play. He gained international experience from heavy involvement in the global nonprofit sector, where his important familiarity with the European corporate culture occurred. In 1999, Tyler was co-author of the concept paper adopted by Paris-based Doctors Without Borders (MSF) to develop a medical research capability for diseases of the developing world neglected by the global pharmaceutical industry. The not-for-profit entity is called the Drugs for Neglected Diseases Initiative. As a founding consultant to MSF, Tyler was a member of the Working Group. He subsequently served on the DNDI Audit Committee overseeing budget and other issues.